If only everything were this easy to acquire and use. 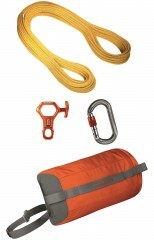 Mammut has packaged an ultralight rap cord with an appropriately proportioned biner and rap device. It comes with a throw bag that you can attach to your pack, using the aforementioned ‘biner if necessary. The rope is a 60 meter length of 6mm aramid line that is light and strong enough to rap on. The Nano 8 is small eight plate designed to handle skinny rope. The Wall Micro Oval screw gate carabiner is a smooth operating locking device that attaches the plate to your harness. All in all, this kit has it all. I bought this system a couple of years ago from skimo.co for skiing and it is as advertised. Light, packs up relatively small, can clip on to your harness so when you get to the business you don't have to dig into your pack for it. Has a somewhat rigid feel, which I like. A bit spendy for a designated rappelling rope, but works well.